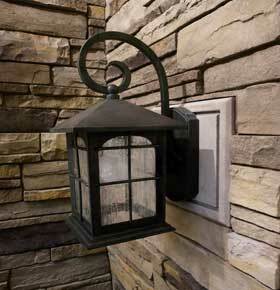 Now you can bring the timeless appeal of stone to your home. Versetta Stone® panelized stone veneer offers the authentic beauty of traditional masonry with a modern installation method. Perfect for remodeling or new construction on interior or exterior walls. Our unique molding and color application precisely replicates natural stone capturing even the subtle nuances found in nature. Made from a minimum of 50% recycled content, this lightweight aggregate material, which is approximately one-quarter the weight of full-thickness stone, is installed with a mechanical fastening system allowing your remodel to achieve the look of stone you want without the inconvenience. Versetta Stone® panelized stone veneer installs in courses using 8″ x 36″ panels that interlock with a tongue and groove system. The 26-gauge galvanized nailing strip allows for fastening with nails or screws directly through it and is rated for 60 years of corrosion resistance. Drain holes are engineered into the nailing strip to allow for incidental water to move through the system. It is made with light-weight, fiber-reinforced concrete enabling tensile and structural strength. Versetta Stone® is rated for wind resistance up to 110 MPH, has a Class A fire resistance rating and passes freeze/thaw testing. Versetta Stone® panelized stone veneer has been rigorously tested to meet all the current criteria for masonry veneer products.